Made by Battery Acid Games, it pits you, the good bacteria, against the challenges of life in the petri dish: limited food supplies and aggressively reproducing competitors. 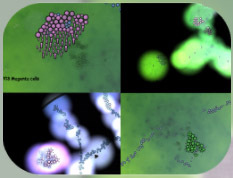 The strategy varies from level to level – some have additional cell types that you can use in doing battle, others have cell types that help you feed on new food sources. You can tell that it’s been made by people who love the science behind it – there’s a fair bit of detail specific to real-world studies of bacterial growth bundled in without bogging down the fun. The lovely glowing background graphics would make a captivating screen saver. They’ve also succeeded with a soundtrack that loops from meditative to tension-building without becoming too repetitive. This entry was posted on Monday, November 22nd, 2010 at 9:57 pm and is filed under REVIEWS. You can follow any responses to this entry through the RSS 2.0 feed. Both comments and pings are currently closed.